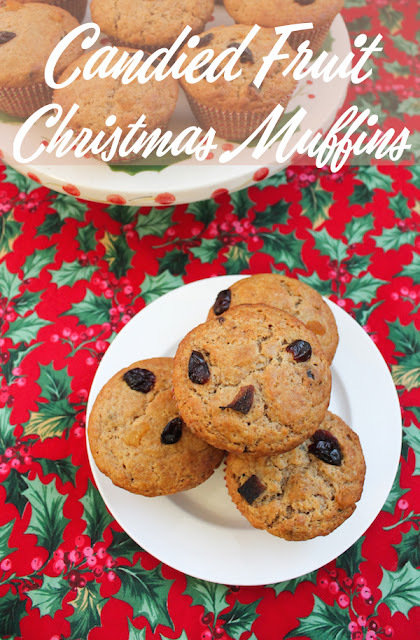 Candied fruit Christmas muffins are made with a sweet, but not too sweet, vanilla crumb, filled with a mix of chewy fruit. They smell wonderful while they bake, filling the house with the sweet scent of Christmas. 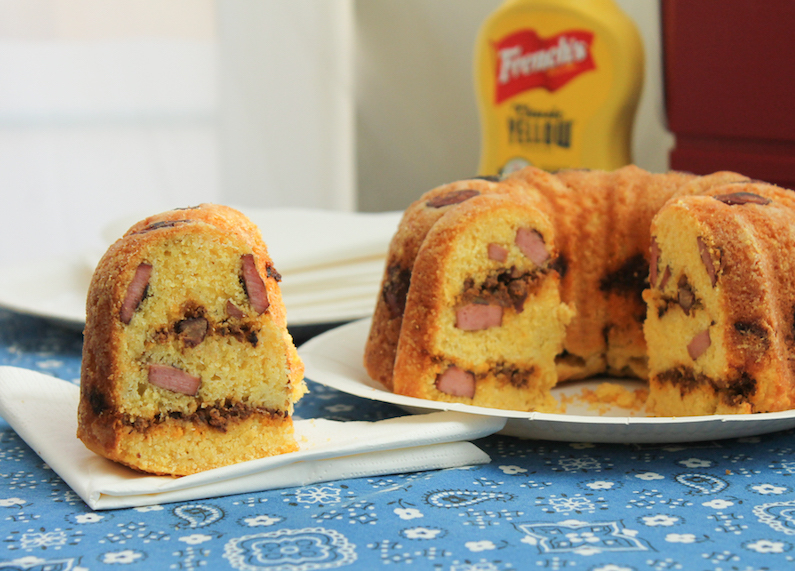 Perfect for a holiday breakfast or snack time with a hot cup of tea. I came across a recipe recently for packaging up muffin mixes as gifts over on the BBC Good Food site and I thought, what an excellent idea! 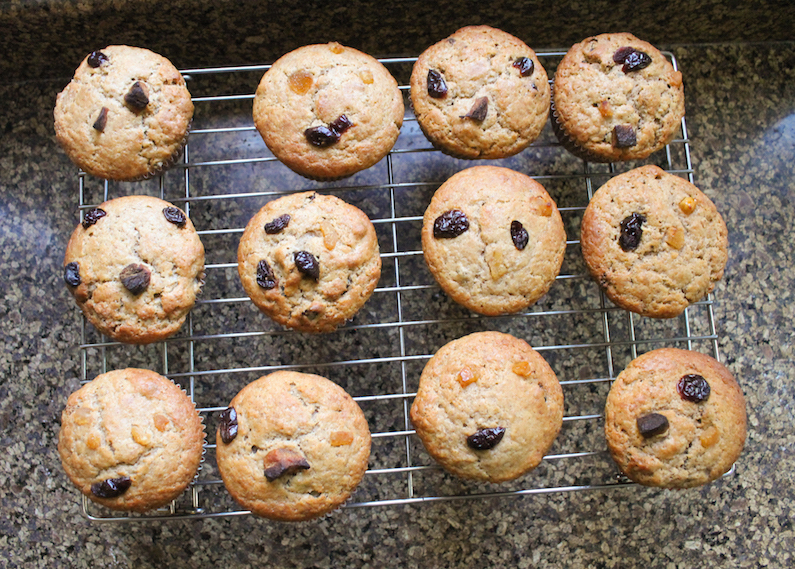 Not that I was going to make the mixes to give away – I don’t have enough friends nearby who like to bake – but the muffins called for mixed fruit with candied peel. 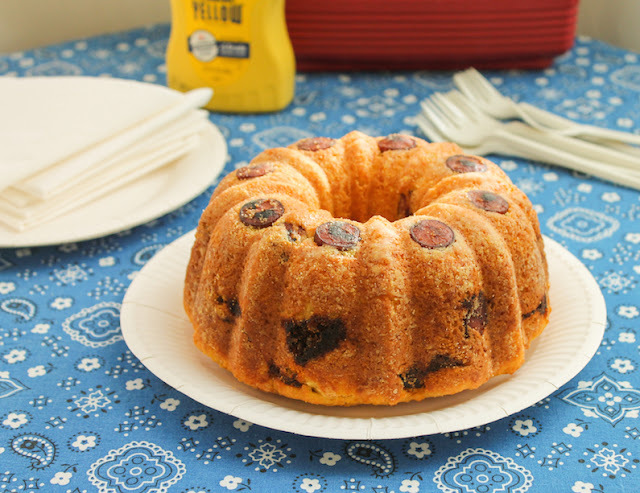 I don’t know if it’s nostalgia for my grandmother’s fruitcake – she made the only version I would ever eat, not too dry with the just the right mix of fruit and nuts – but candied fruit always makes me think of Christmas. 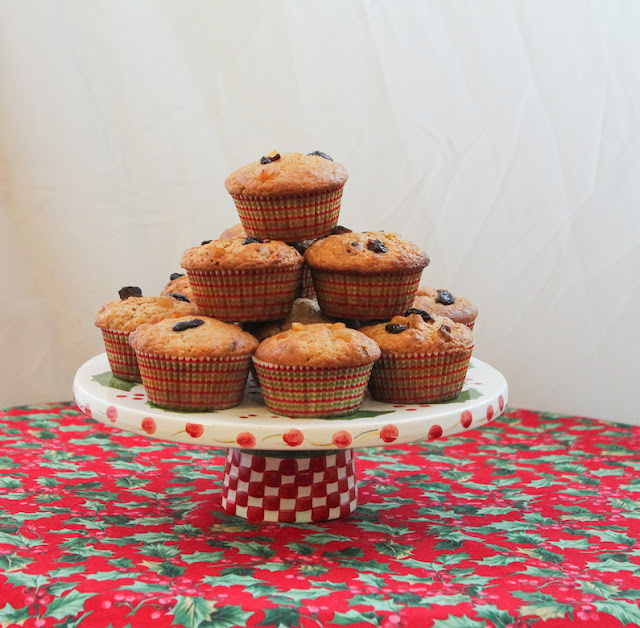 What could be better for this month’s Muffin Monday than a candied fruit Christmas muffin in anticipation of the holidays? 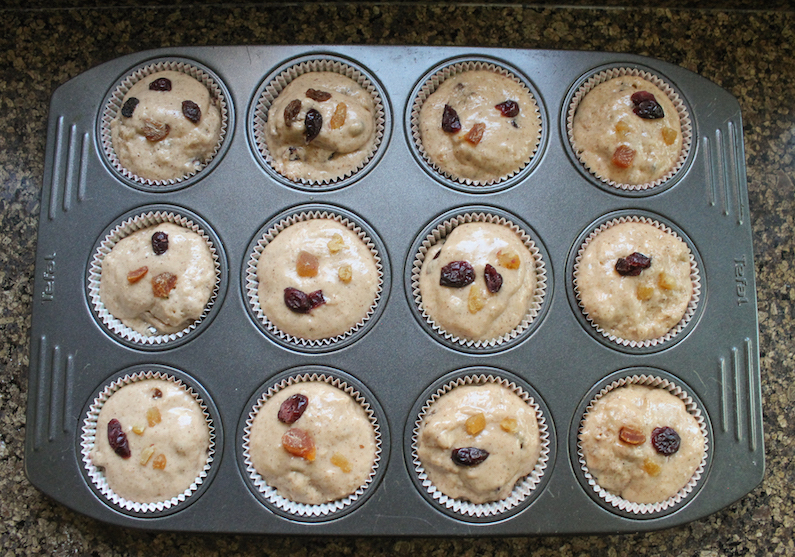 I used my favorite make-ahead breakfast muffin recipe but I cut back on the sugar because of all the candied fruit. These are sweet enough, I promise. 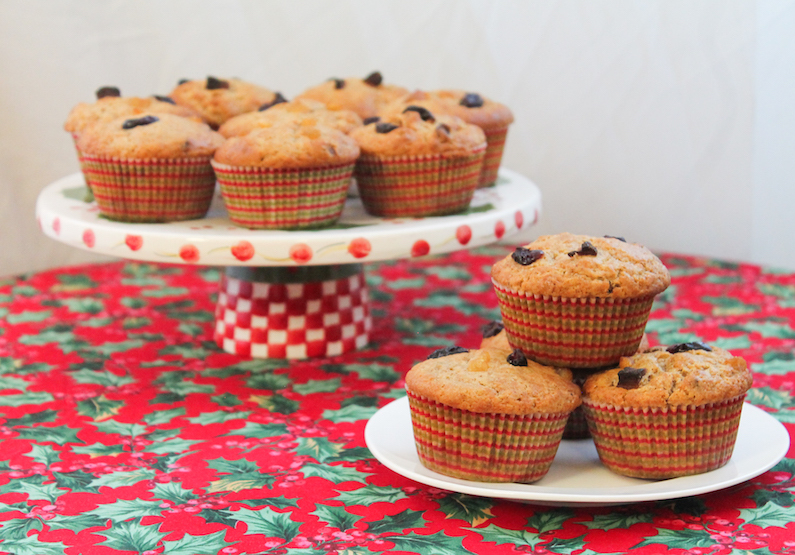 The chewy fruit and spices make these muffins smell and taste like Christmas. Put these in the oven on Christmas morning and your family will pop out of bed to find out what you are baking! Preheat oven to 350°F or 180°C. Generously grease cups and top of 12-cup muffin tin or line your pan with muffin paper cups. 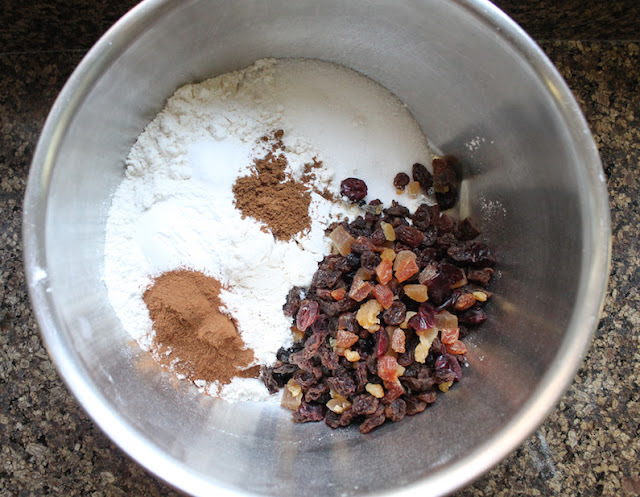 In a large mixing bowl, whisk together your flour, sugar, baking powder, cinnamon, mixed spice and salt, along with the candied fruit. 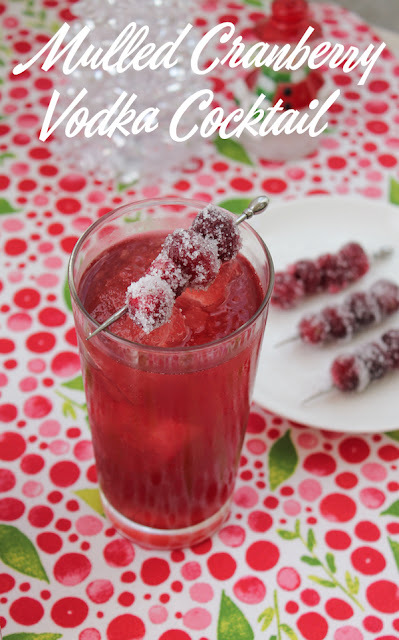 Use your clean hands to mix the fruit in, rubbing the pieces between your fingers to separate those that are stuck together so they can be coated with the flour mixture. 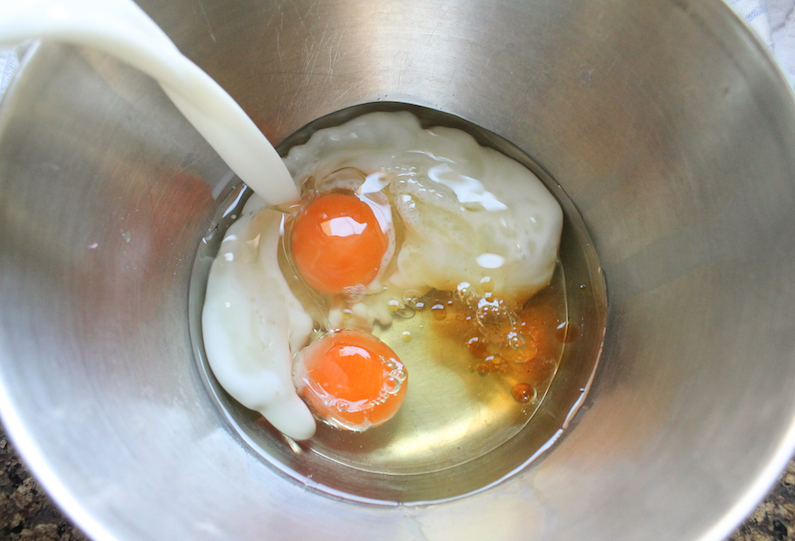 In another bowl, whisk together the milk, oil, vanilla and eggs. 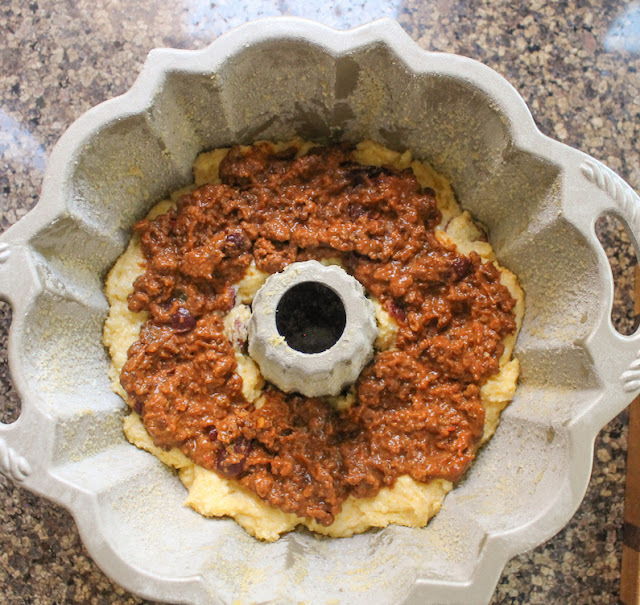 Pour the wet ingredients into the dry ingredients and gently fold just until dry ingredients are moistened. Divide your batter relatively evenly between the 12 muffin cups and top with a few pieces of candied fruit. Check out all the other wonderful muffins my Muffin Monday group is sharing today! Tender pumpkin insides and crunchy sugar outsides make these cinnamon pumpkin cookies perfect for your holiday table. I love the sparkle of demerara sugar. Rolling the cinnamon pumpkin cookie dough in those big sugar crystals is what makes these cookies special, plus it also makes the dough less sticky and easier to shape. If you can’t find it in your local supermarket or bakery supply store, you can order it from Amazon. <affiliate link*. 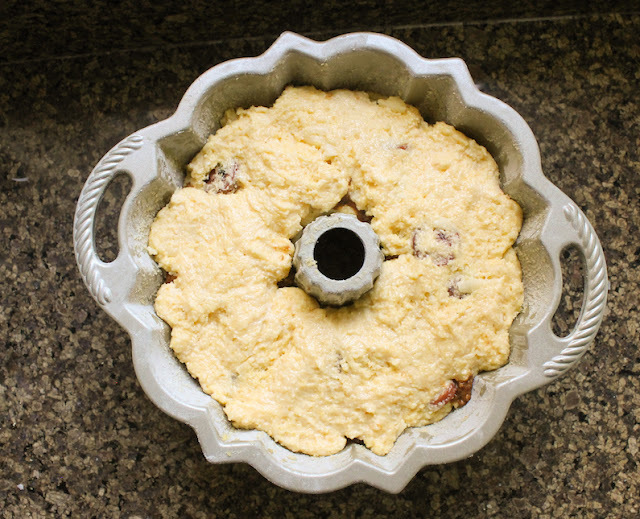 I use it on all sorts of baked goods, when a little shine is welcome, like my chili maple bacon cookies and blueberry pie with polenta shortcake crust. It also makes a rich and wonderful simple syrup to use in cocktails like an Irish blackberry cobbler or pomelo margaritas. 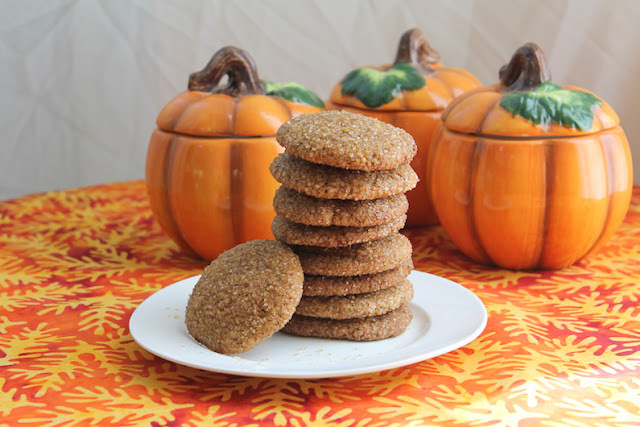 But this month for our Creative Cookie Exchange, we are sharing cookies that make an easy, last minute Thanksgiving holiday dessert or treat so I made cinnamon pumpkin cookies. They can be made ahead, frozen, and baked when needed, so you are ready at a moment's notice when unexpected guests arrive. Or you can bake them ahead of time and freeze them after. They thaw almost instantly, always a plus for a busy holiday. Mix up a batch of these fabulous cookies for your next gathering. 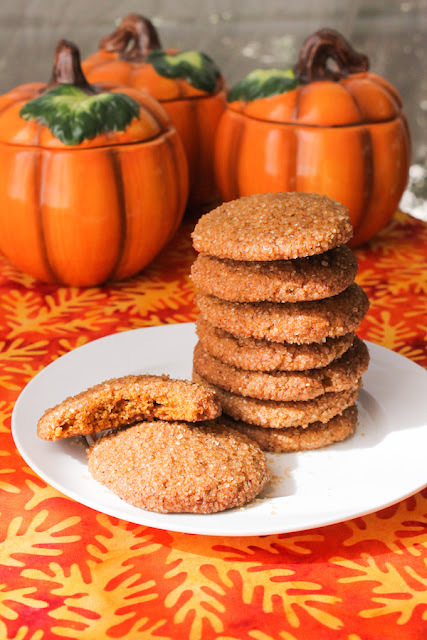 I almost called these pumpkindoodles, you know, like snickerdoodles but pumpkin. But there is nothing absent-minded about that crunchy demerara sugar. It's all there. Whisk together your flour, salt, baking powder and ground cinnamon in bowl. Set aside. 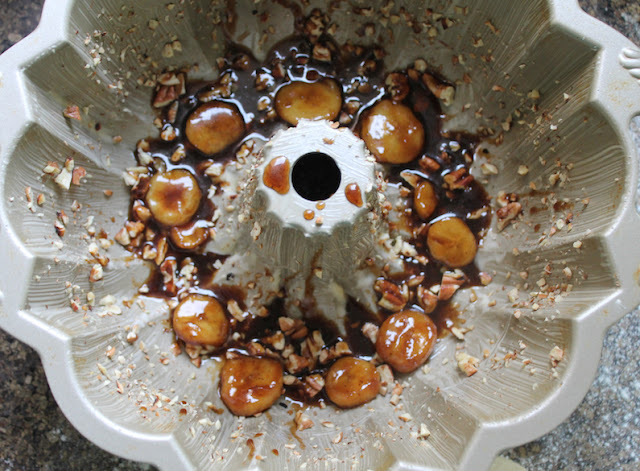 With your hand beaters or in the bowl of your stand mixer, cream together the brown sugar, butter and molasses. Tip: The molasses will slide easily off of your measuring spoon if you give it a quick spray with Pam or your favorite non-stick spray first. 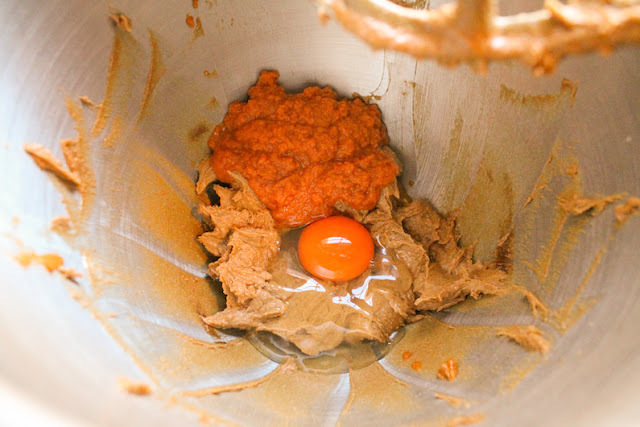 Add in the egg and pumpkin and beat for another minute or so, scraping down the bowl halfway through. 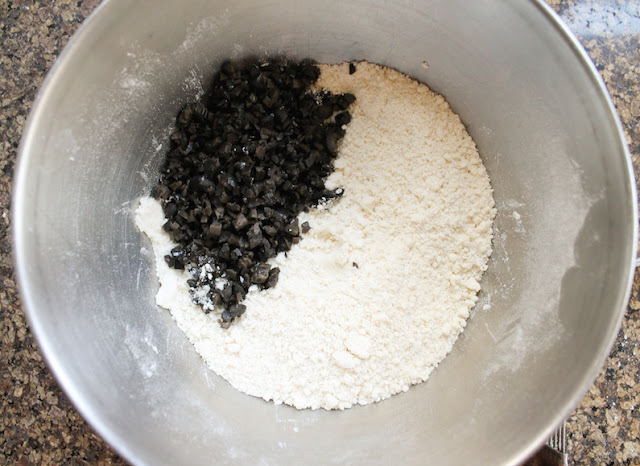 With the beaters on low, add in the flour mixture a little at a time, until it is fully incorporated. Line a baking pan with parchment and use a scoop or a couple of tablespoons to divide the soft dough into about 24-26 portions. Pop the pan into the freezer and set a timer for about 45 minutes, if you are planning to bake the same day. Meanwhile, mix the demerara sugar with the ground cinnamon in a large mixing bowl. When the dough is almost finished chilling, preheat your oven to 350°F or 180°C and prepare your cookie pan by lining it with baking parchment or a silicone liner. 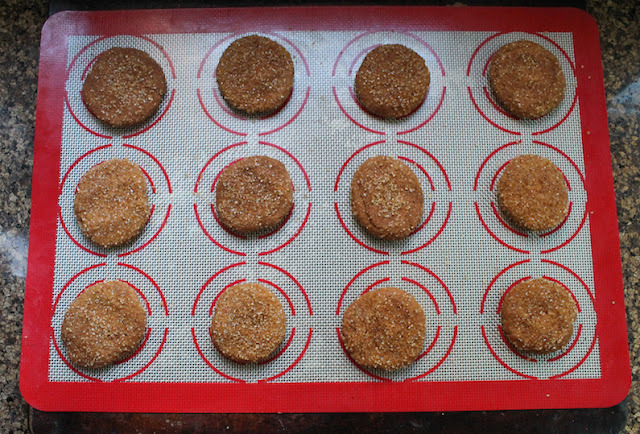 Remove only 12 (or however many cookies your pan can fit) pieces of dough from the freezer. 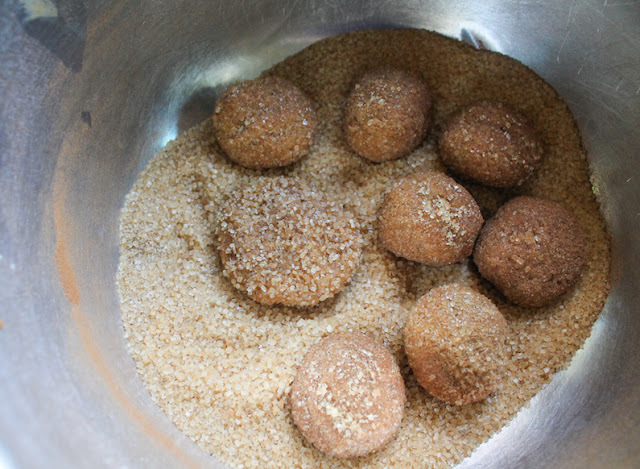 Roll each into a ball and pop it in the bowl of cinnamon sugar. Shake the bowl to coat. 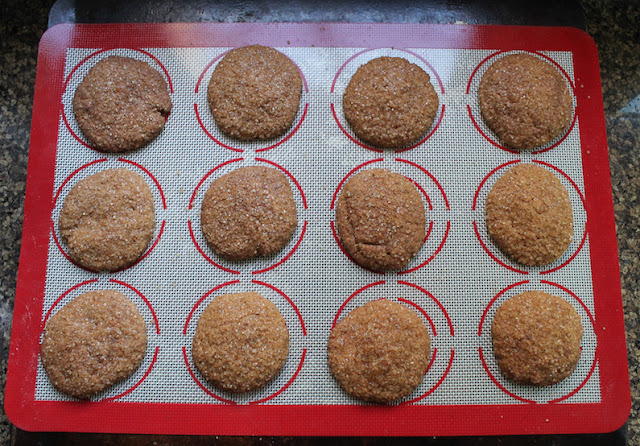 Use your hands to press each ball into a disk shape and press both sides of the disk back into the cinnamon sugar. Place them on the prepared pan. 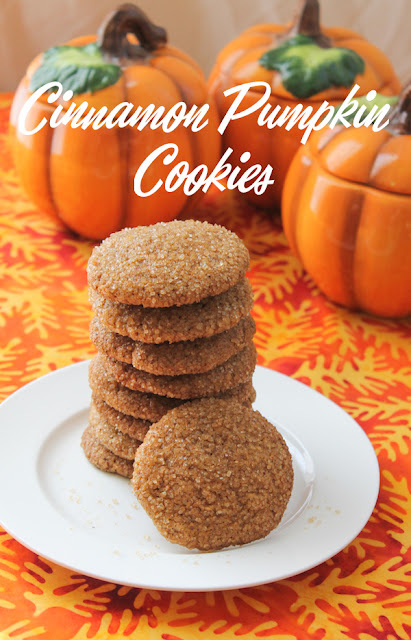 Bake in your preheated oven for about 12-14 minutes, or until the cinnamon pumpkin cookies are puffed and set. 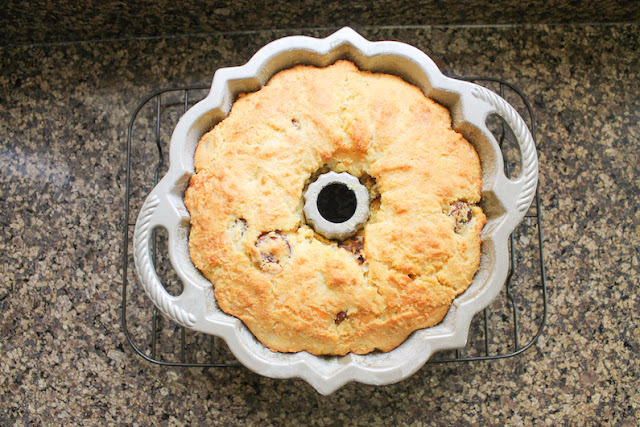 Remove from the oven and leave to cool completely before serving or storing in an airtight container. 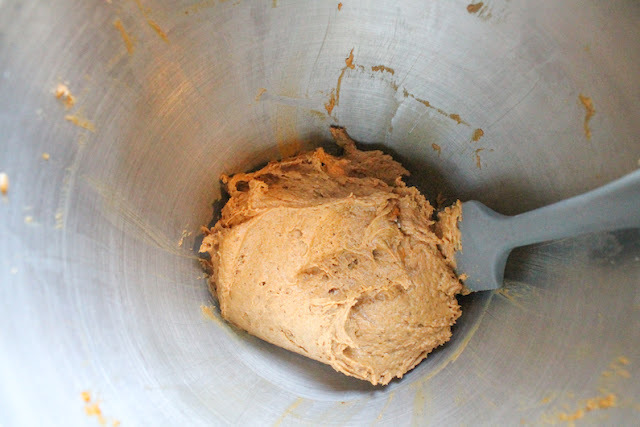 Repeat with the remaining dough, until all the cookies are baked. Alternatively you can completely freeze the dough pieces so they won’t stick together, then transfer them to a Ziploc bag. Keep them frozen until you are ready to bake. Remove just the number you want to bake from the freezer. 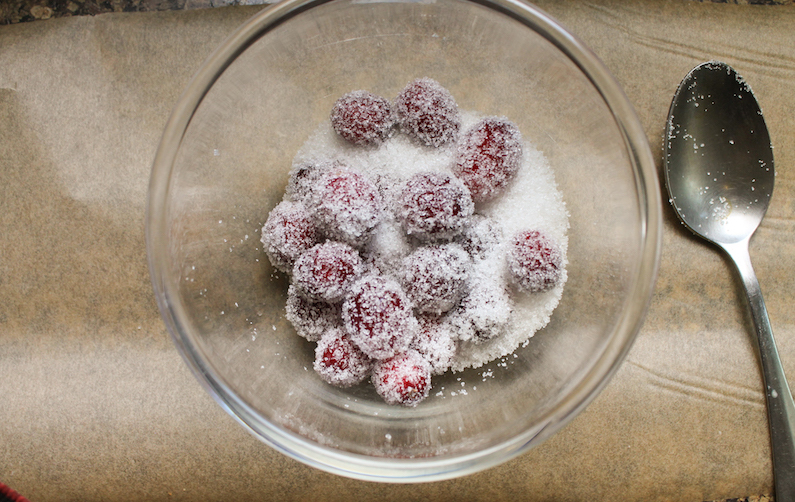 Let them thaw just enough so you can roll them into balls and continue with the instructions for rolling them in the sugar, shaping and baking. I’ve tested it both ways and the cookies turn out great either baked the same day or after freezing the dough. 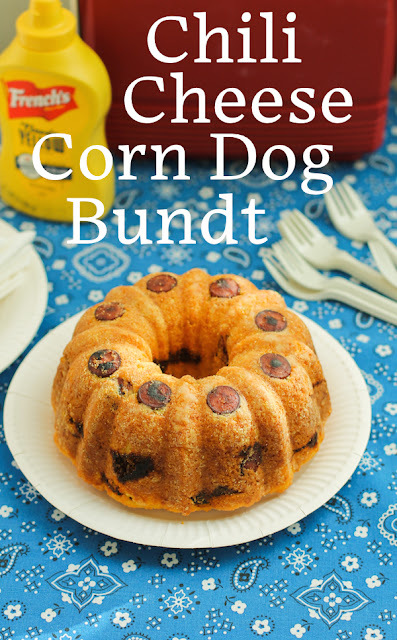 Are you needing last minute treat recipes for Thanksgiving? Check out all the cookies we’ve got for you today! 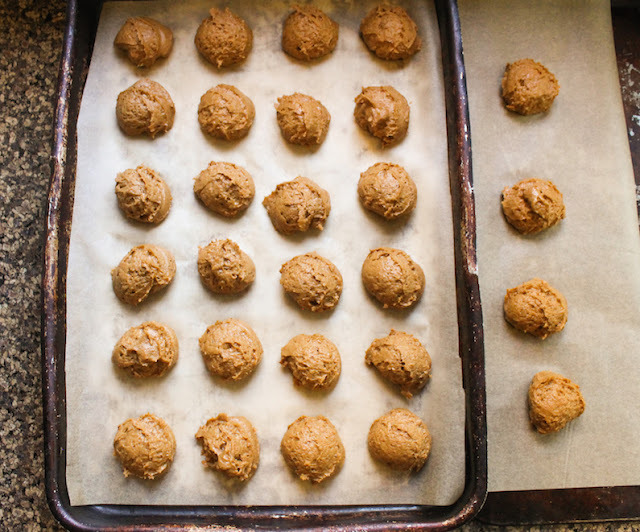 Maple Walnut Spice Cookies from What Smells So Good? *Disclaimer: Amazon affiliate links earn me a few pennies when you make a purchase by following one, even if you don't buy the item I've listed. Your cost remains the same. When you want to lighten up your menu for the holidays, this salade composée of “roasted” sweet potatoes, lentils and French beans, dressed with a shallot vinaigrette, Mandarin oranges and cilantro is perfect. Festively colored and full of flavor, it's substantial enough to be a main course, or serve smaller portions as a starter or side dish. During the roasting hot days of summer in Dubai we eat a lot of salads, what the French would call salades composées, created as they are of many colorful ingredients and substantially suitable for a main course. 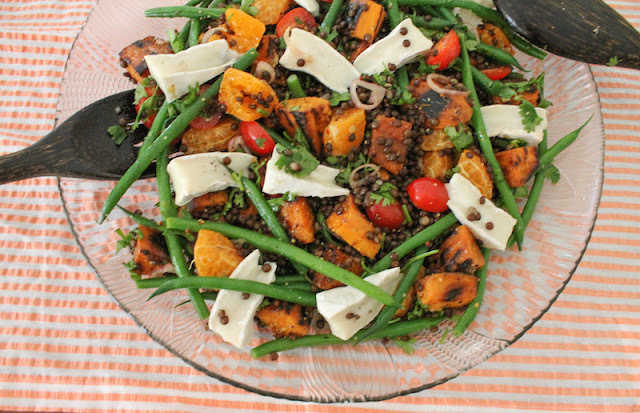 Our days are slightly less hot right now but we still want mostly cool food in the evenings and, with the supermarkets full of fall produce, our salads take a decidedly autumnal turn with the addition of sweet potatoes or pumpkin or butternut squash. 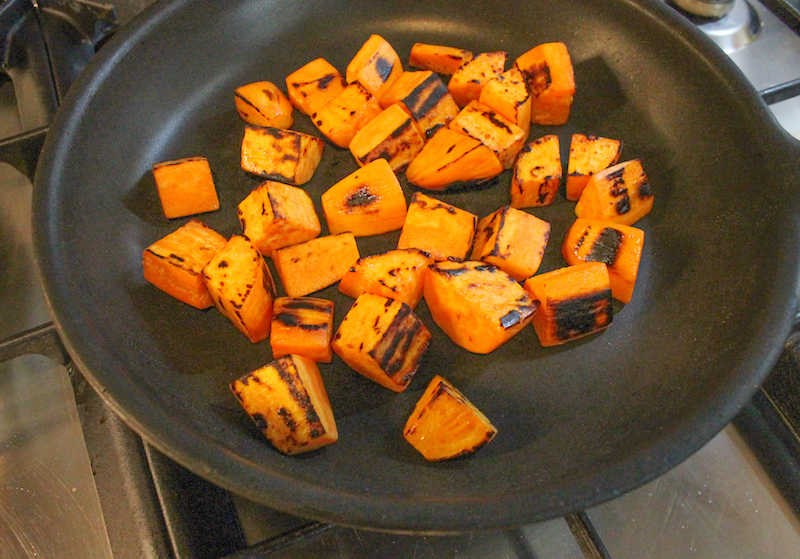 Since I try not to turn the oven on unless absolutely necessary, I “roast” the sweet potatoes in a dry non-stick skillet, only adding a small drizzle of olive oil when the potatoes cubes are well-browned, even a little charred in places. 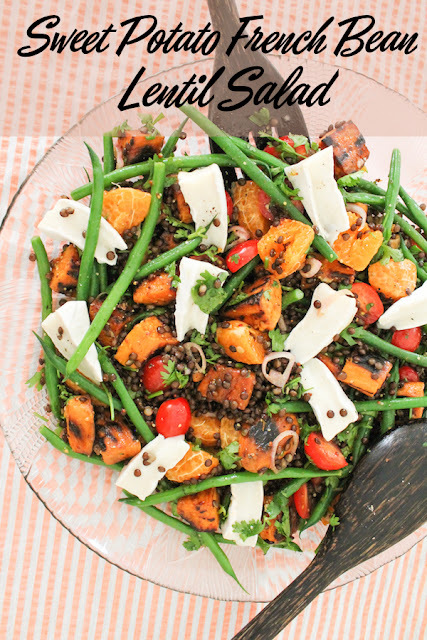 I’ve given the quantities for my salad but feel free to add more tomatoes if you love them or choose a different cheese or substitute grapefruit for the oranges and chickpeas for lentils or whatever! 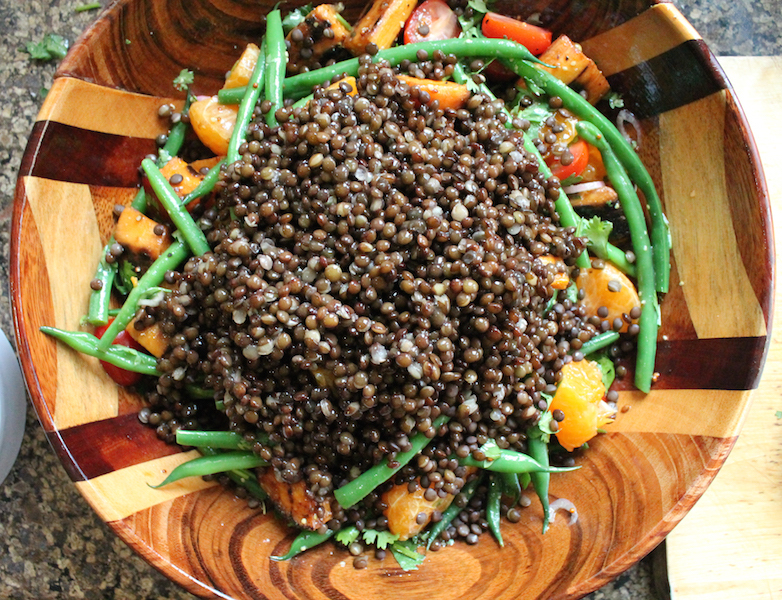 This salad is easily adaptable to your taste. This week Sunday Supper is sharing holiday salads. Make sure to scroll down to the bottom of my recipe to see what other wonderful dishes we have for you to try. 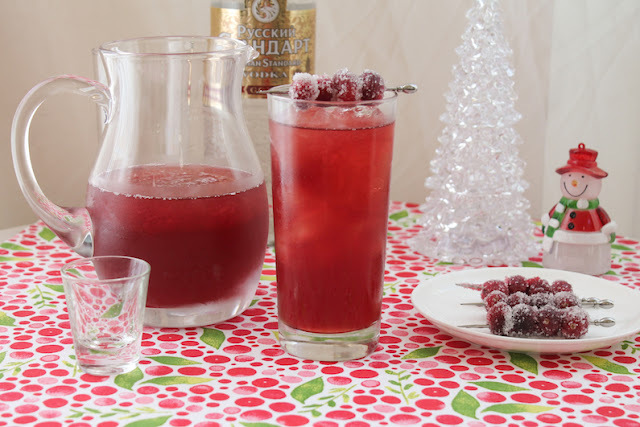 This served two of us for a good supper with some leftovers for lunch the next day but it's sure to be a favorite on your holiday table as well. Peel and cut your sweet potatoes in bite-sized chunks. Toss them into a dry non-stick skillet and cook over a medium high to high fire, turning and stirring them frequently until they are browned all over. Drizzle in a little olive oil and stir the cubes to coat. Add in a generous splash of water, reduce the heat and cover the pan tightly. 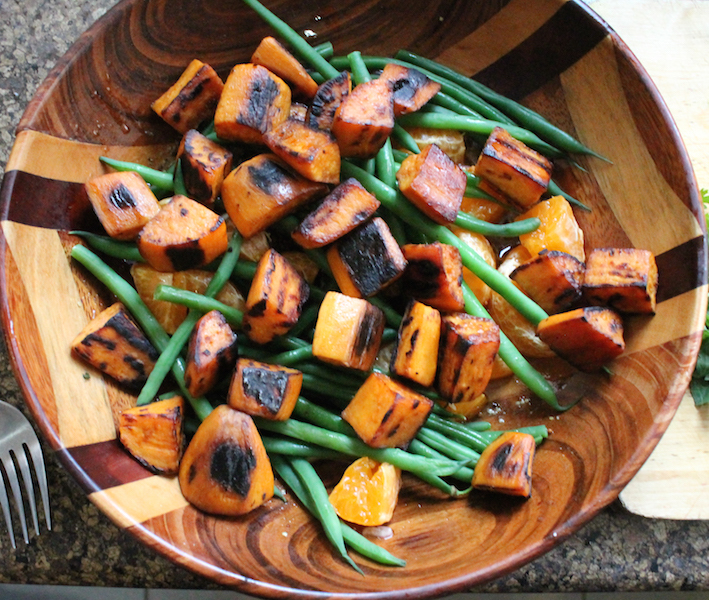 Cook the sweet potatoes for about 10 minutes or until fork tender. Remove from the stove and leave to cool. 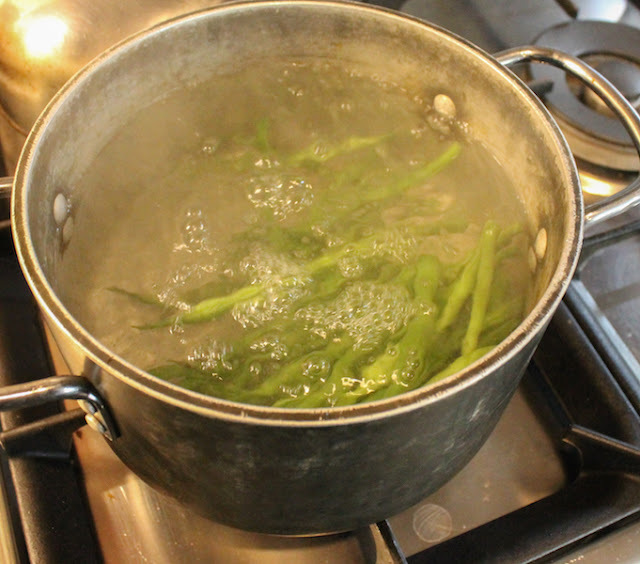 Cut the stem ends off of the fine French beans and blanch them in slightly salty boiling water for 3-5 minutes. Meanwhile, fill a bowl with ice and water. 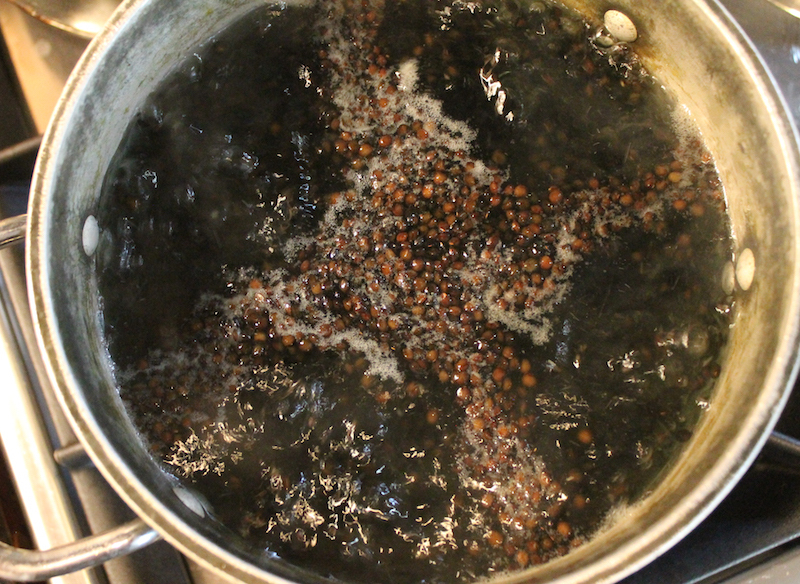 Use tongs or a slotted spoon to remove the beans from the boiling water and immediately plunge them into the bowl of ice water. 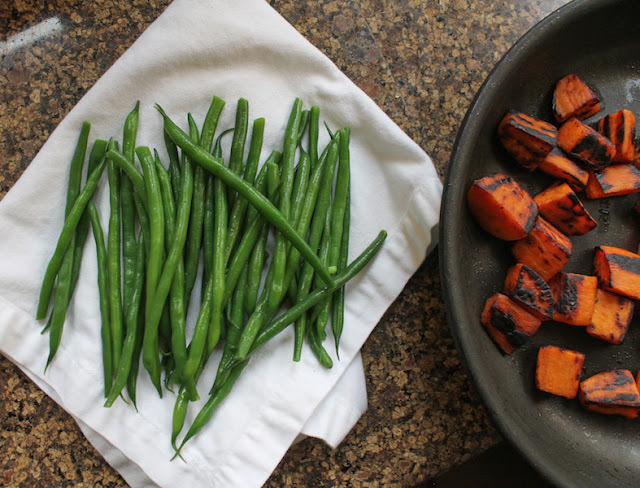 When the green beans are cold, remove them from the ice water and drain well on a clean tea towel. Add your lentils to the boiling green bean water and cook for about 20 minutes or until they are just tender. Drain your lentils, rinse them and leave them to drain again. Slice your shallot as thinly as you can and put it in a large bowl. 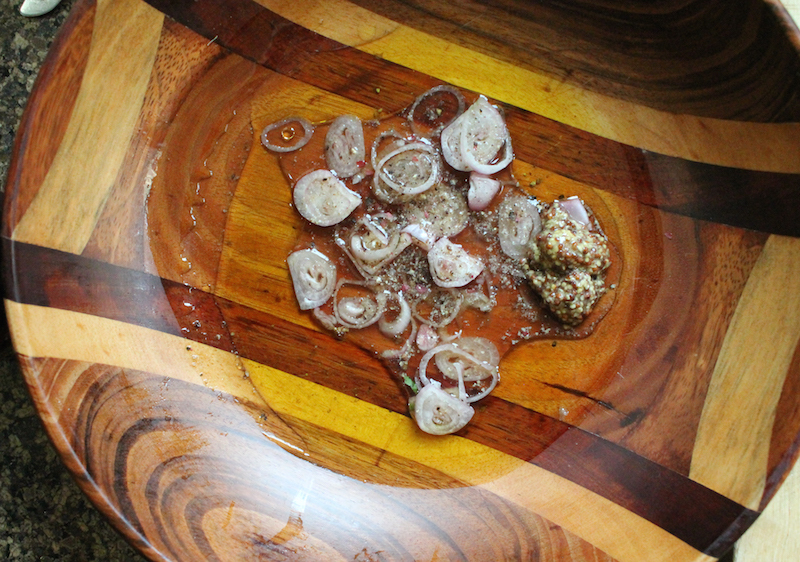 Pour the vinegar over the sliced shallot and set aside. This reduces the sharpness of the raw shallots while flavoring the vinegar. Peel your Mandarin orange and pull the pegs apart. 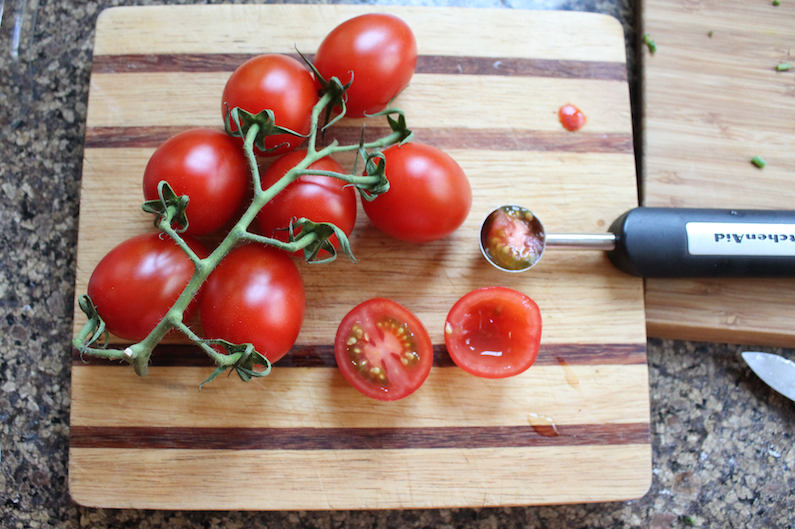 Use a sharp knife to slice off the hard center and remove any seeds. 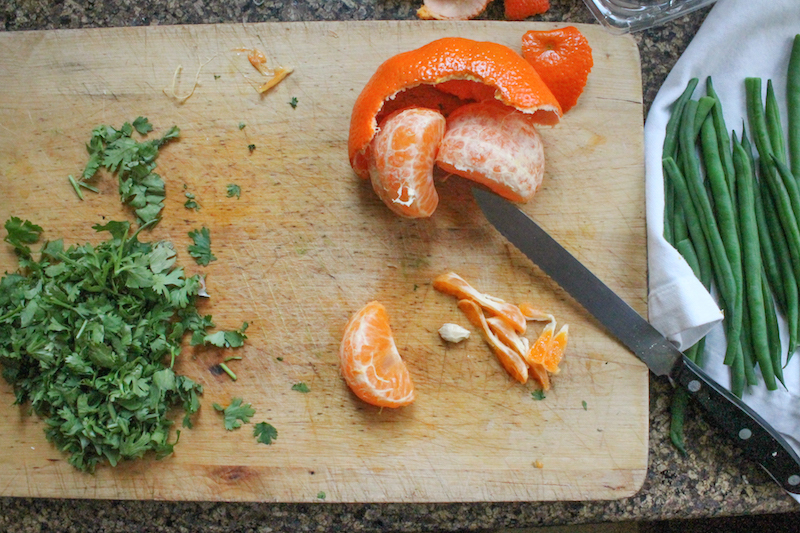 Cut the orange pieces in half. 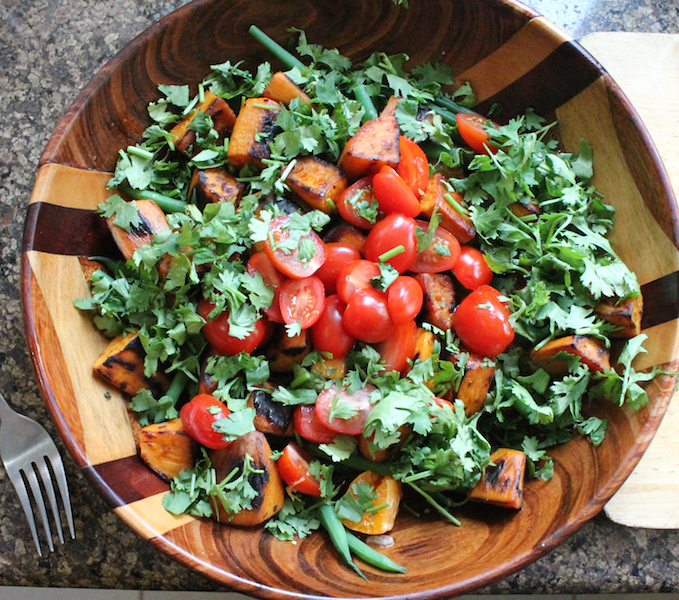 Halve your little tomatoes and chop the leaves and tender top stems of the bunch of cilantro roughly. Mix the whole grained mustard and olive oil into the vinegar and shallots, along with the sea salt and a few good grinds of fresh black pepper. 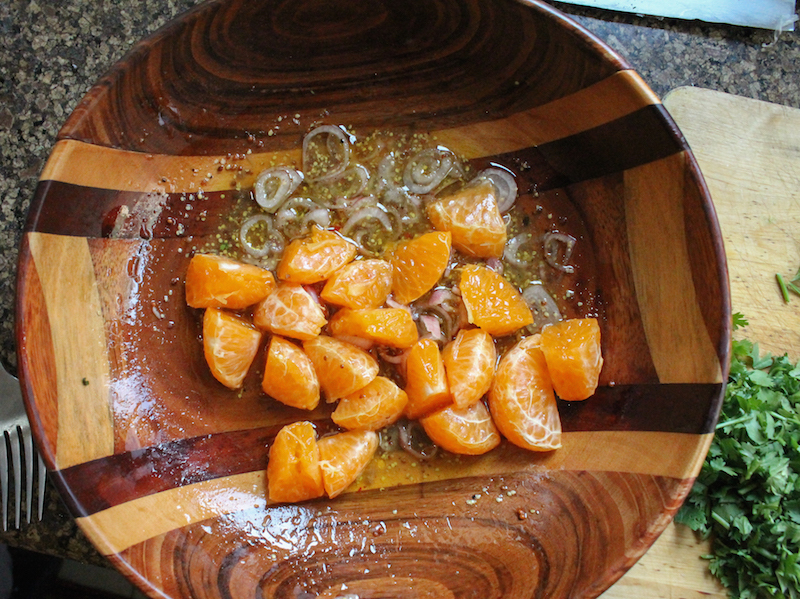 Add in the cut oranges and stir well. Add the “roasted” sweet potato and blanched green beans to the dressing bowl. Top those with the cilantro and tomatoes. 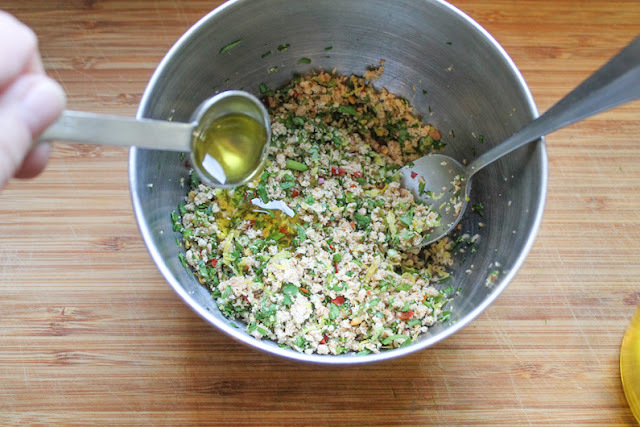 Toss the salad thoroughly, making sure to reach deep and dress everything with the dressing and shallots at the bottom of the bowl. 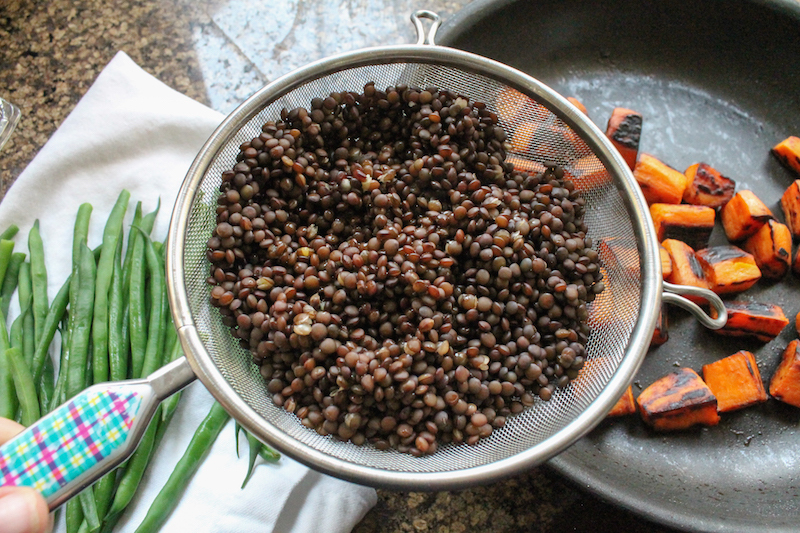 Finally, add the drained lentils and toss again. 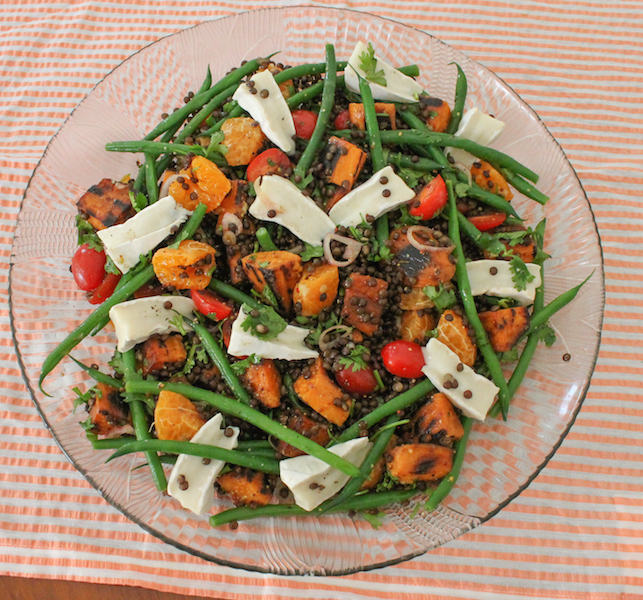 Scoop the salad into a pretty serving dish, if desired, and top with small wedges of soft rind goat cheese. Check out all the holiday salads we have for you today! 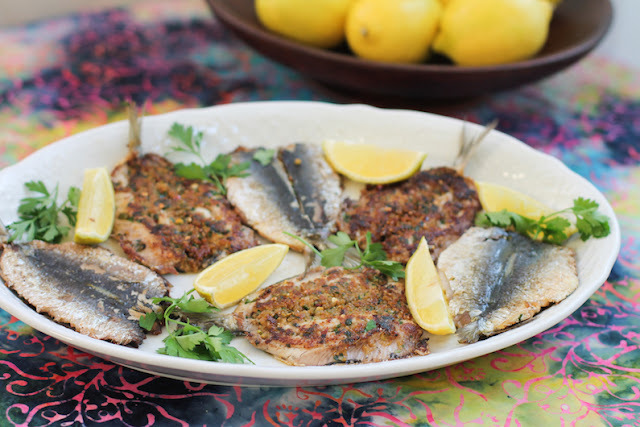 Butterflied Stuffed Sardines make the most of these flavorful fish, by removing the bones and adding even more flavor with a well-seasoned bread crumb stuffing. Growing up, I never knew that there was such a thing as fresh sardines. In the Gulf of Mexico, seafood was plentiful but we never seemed to eat smaller fish. All the fishermen I knew threw the little guys back in. That all changed for me after a holiday to Portugal. Fresh sardines were everywhere! In grocery stores, roadside dives, beach huts and even fancy restaurants. After that, I cooked them whenever the opportunity came up. One summer, about 16 or 17 years ago, I was fangirling over Jamie Oliver’s second book, called either The Return of the Naked Chef or The Naked Chef Takes Off, depending on whether you have the US or UK release. I didn’t realize they were the same book so, of course, I have one of each. We happened to be in the Channel Islands where sardines are readily available and super cheap. Not everyone in our group was keen on all the bones so Jamie’s grilled butterflied sardines sounded like a recipe everyone would like. It is fiddly to remove the backbones but it sure makes eating these beauties a breeze. Here’s the funny thing. 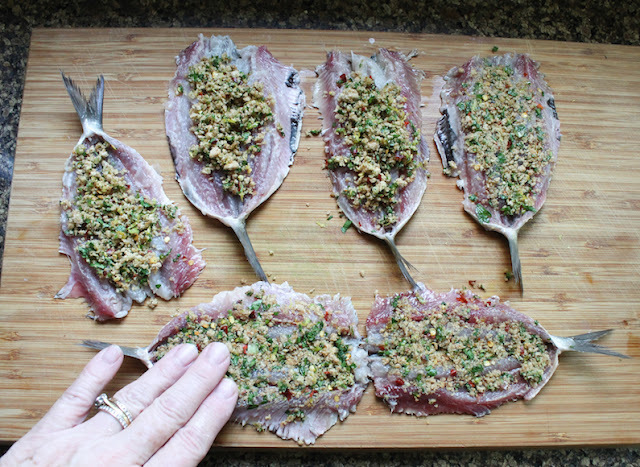 I was discussing this month’s “seafood with stuffing” Fish Friday Foodies challenge with both my husband and younger daughter and I asked them if they remembered these butterflied stuffed sardines from so long ago. They both did! And then they wanted to know why I hadn’t made them but maybe once since. I have no excuse but to say, I won’t leave it that long before the next time. 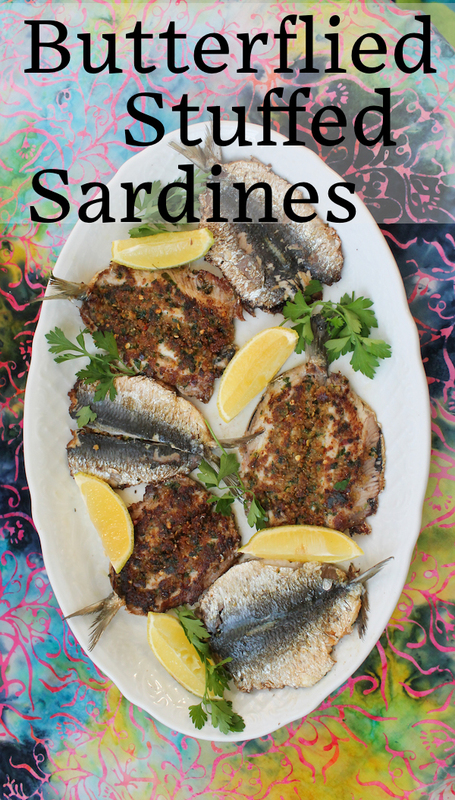 This is the perfect dish for folks who love fresh sardines but hate dealing with the bones! Rinse your sardines with plenty of cool water and set them on some paper towels to dry. 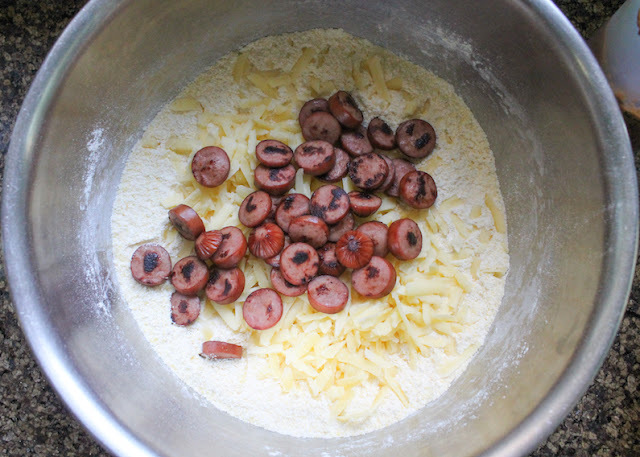 Mix the rest of the ingredients together well in a bowl and set aside. Cut the heads off of the sardines and discard. With one hand press each sardine open and use the other hand to work the spine free of the body. This is tricky to get started but once it’s free up near the top (where the head used to be) it comes out rather easily the rest of the way down. You can remove the tails, if you'd like to, but I thought they were prettier with their tails so I snipped the backbones with scissors and left them the tails intact. 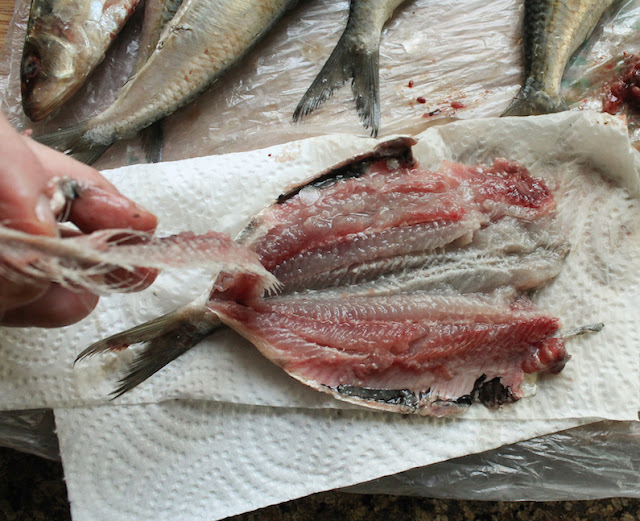 Give the sardines another rinse and pat dry with paper towels. Divide the stuffing between the sardines and use damp hands to pat it down. 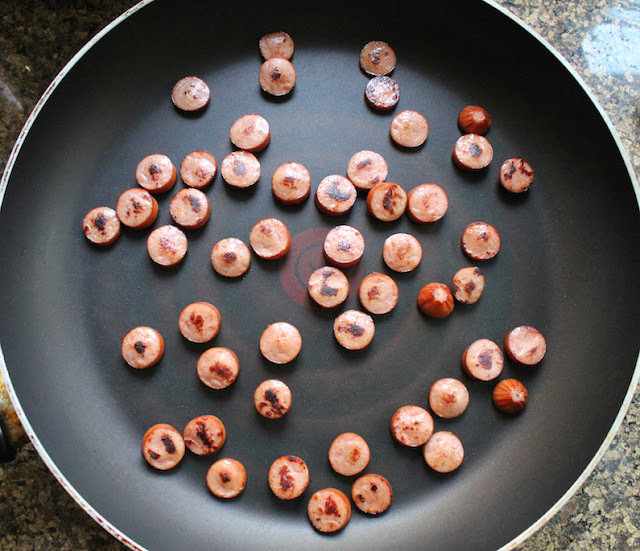 Heat a non-stick pan with a small drizzle of olive oil over a medium flame. 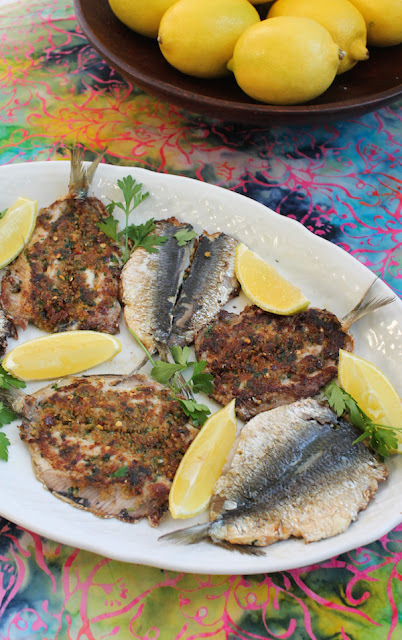 Cook the sardines for a few minutes on each side, until they are cooked through and the stuffing is golden. I put them skin side down first then carefully flipped them over. I also cooked them in two batches so as not to crowd the pan, which makes flipping carefully a challenge. Plate them up with a few springs of parsley and some lemon wedges so everyone can add a squeeze, if desired. 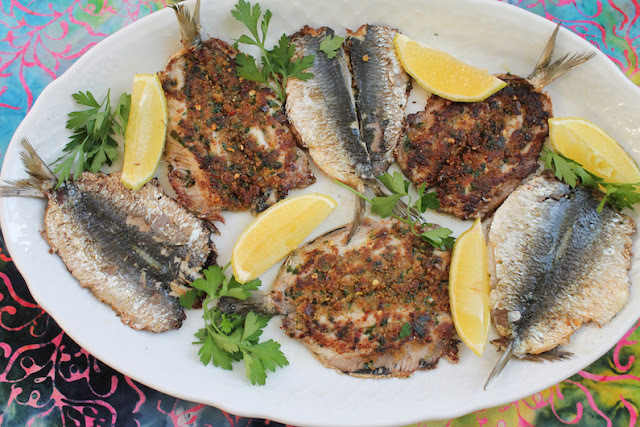 If you love fresh sardines, you might also enjoy my whole pan-fried sardines, another Fish Friday Foodie recipe. As previously mentioned, this month’s theme is seafood with stuffing or, even, seafood stuffing. After all, stuffing is not just for turkeys! Many thanks to our host is Wendy of A Day in the Life on the Farm. Check out all the great recipes we are sharing today. 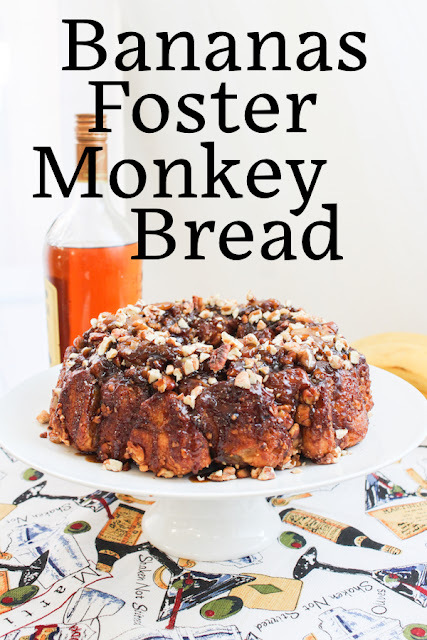 Bananas Foster Monkey Bread takes everyone's favorite pull apart loaf (usually made with bread dough balls rolled in sugar) to a whole new holiday level with bananas and rum. 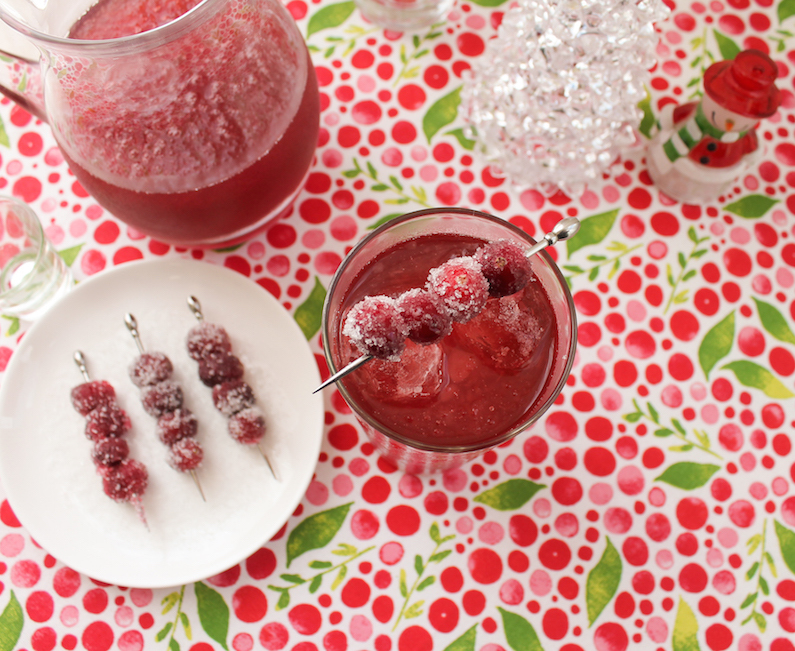 Put one of these guys on your party table and watch it disappear. 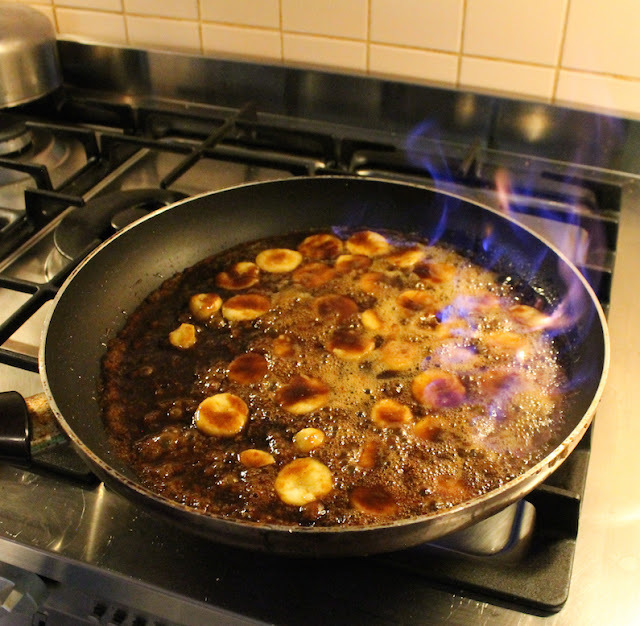 Bananas Foster is a special dessert that was created and served first, table-side, at Brennan’s in New Orleans. About five years ago, I made Bananas Foster Muffins for a special Muffin Monday, just as we moved in Dubai because that was kind of a special occasion. 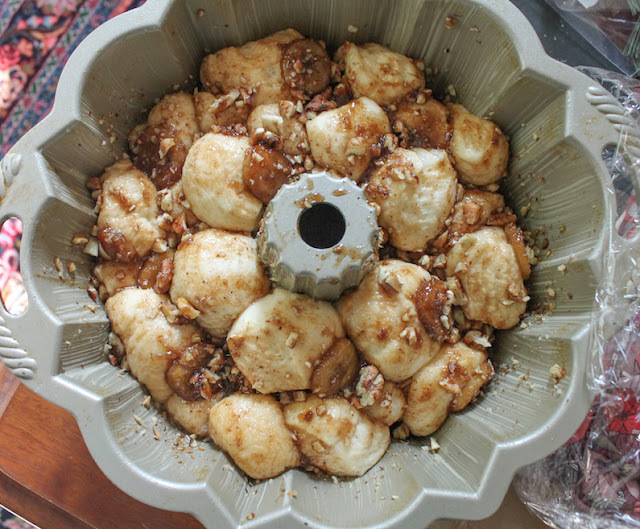 Today is the exact anniversary of our arrival, which is what made me think of Bananas Foster again for this month’s Bread Bakers theme of pull apart breads. 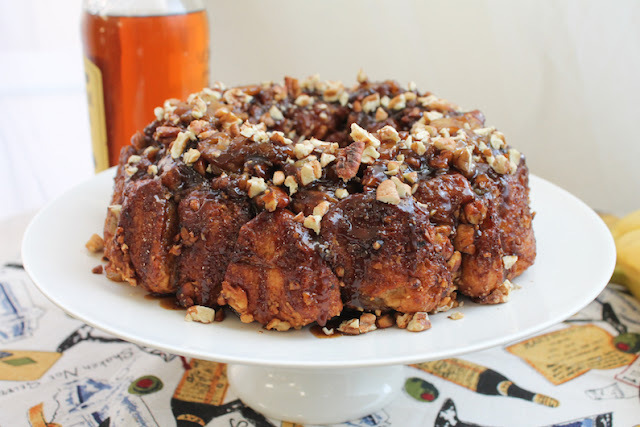 After all, most monkey breads have sugar and cinnamon. 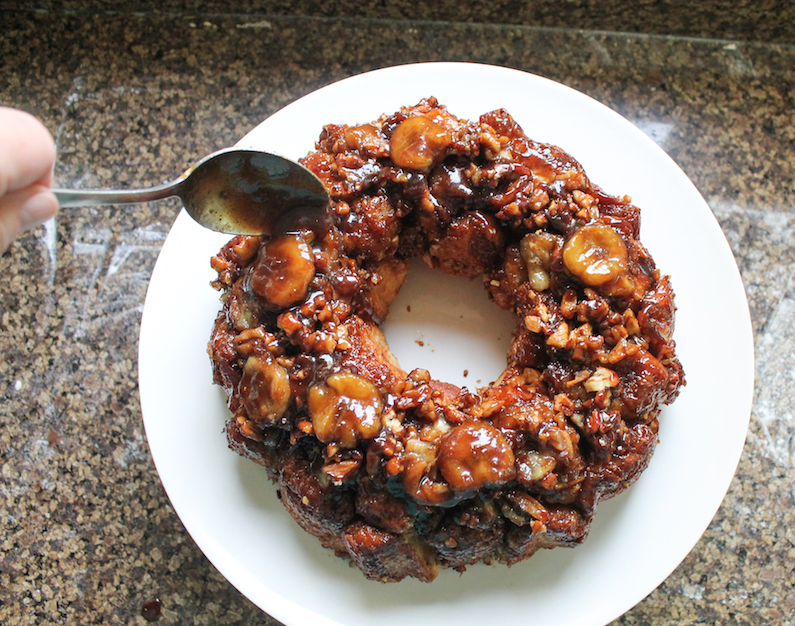 Some have a sticky toffee or caramel glaze. 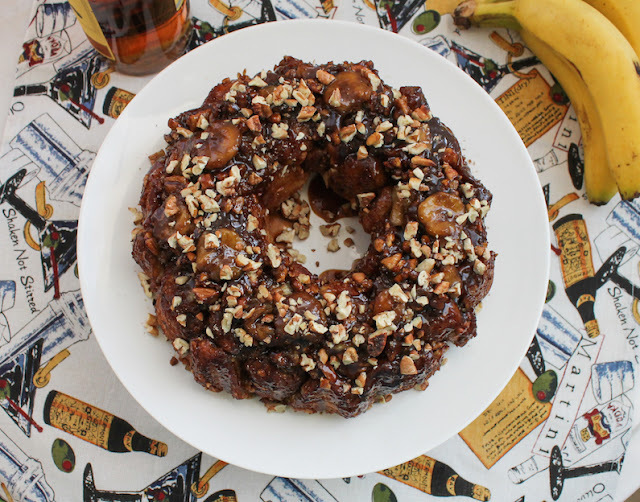 Bananas Foster sauce has the added bonus of rum, perfect for a celebration. 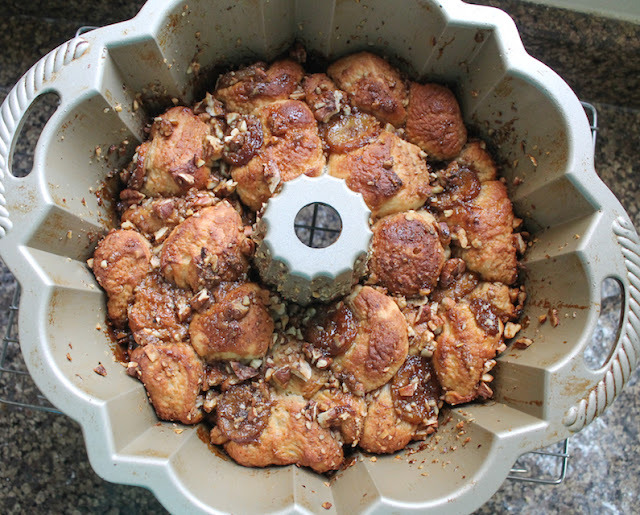 The dough is adapted from the King Arthur Flour monkey bread recipe. 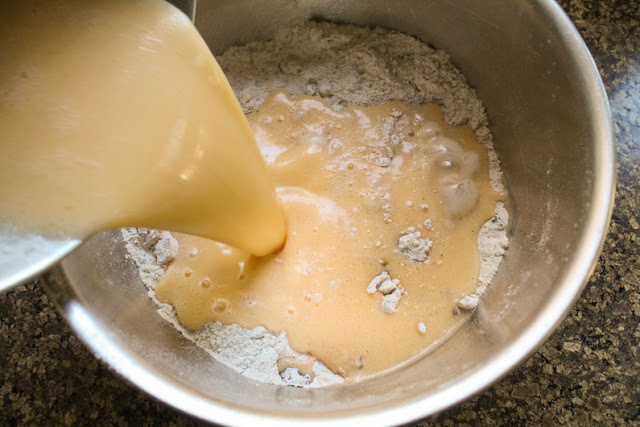 To make the dough, put your sugar, yeast and warm water in your mixing bowl. Leave to prove for a few minutes. 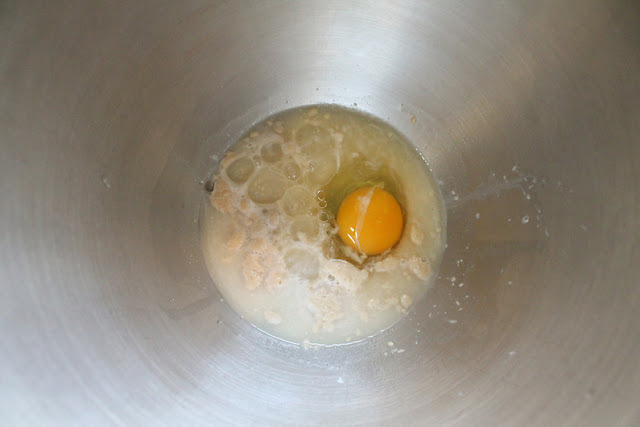 When the bubbles begin forming, mix in oil, egg and salt. Add 1 cup or 125g of the flour, stirring to blend. 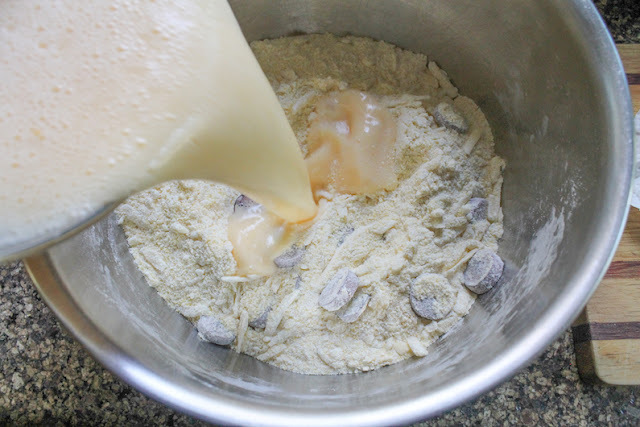 Add in the rest of the flour, mixing well. Let the dough rest for 5 minutes. Knead the dough by hand or machine until it is stretchy and smooth. 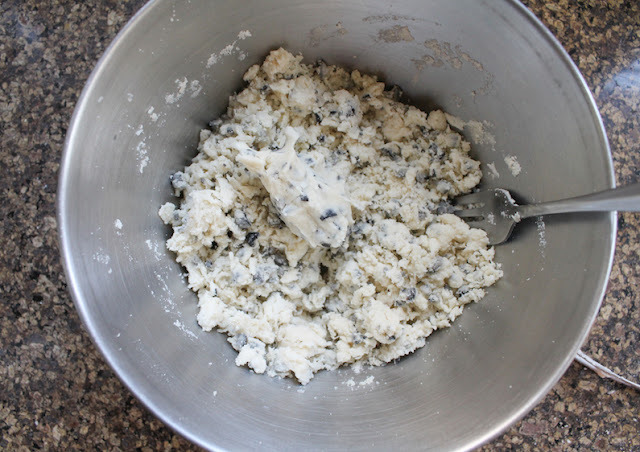 Form the dough into a ball and lightly grease your mixing bowl. 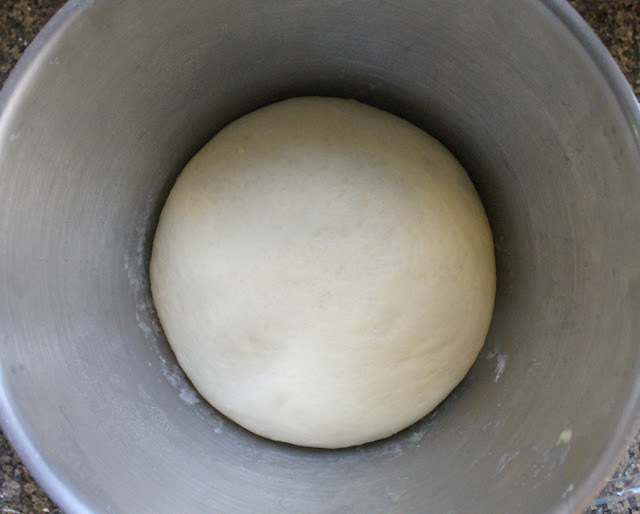 Put the dough ball in the greased bowl and cover the bowl with cling film. Leave in a warm place for 30 minutes or until the dough has doubled in size. 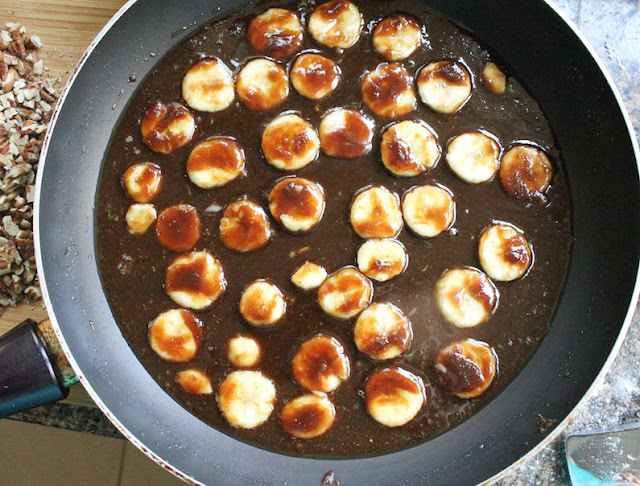 While the dough is rising, you can make your bananas Foster sauce. Cut your bananas into about 1/2 in or 1 cm slices. Combine the butter, brown sugar, and cinnamon for the sauce in a skillet. Place the pan on a low heat, and cook, stirring, until the brown sugar dissolves. Add the bananas to the pan. Turn the heat up a little, until the melted sugar is bubbling slowly. When the banana sections soften, carefully add the rum. Tip the pan slightly so the rum vapor will ignite. It’s a little scary and happens quite suddenly so do be prepared. The flame burns off the alcohol and also helps thicken the sauce. Remove from the heat. Set aside and allow to cool. This makes about 1 3/4 cups or 414ml of sauce. We are going to use about 1 1/4 cups or 295ml in the monkey bread and save the balance for pouring on the bread when it’s served. Thoroughly grease a 10 or 12-cup nonstick Bundt pan with butter and sprinkle in a small handful of the chopped pecans. Set aside a handful of the pecan for decorating the bread after it bakes. Once the first rise of the dough is finished, tip the dough out onto a lightly floured surface. Press it down gently then cut the dough into about 20-23 balls. 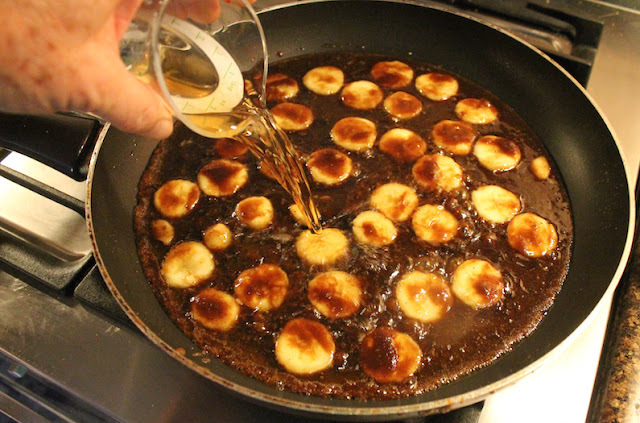 Drizzle some of the bananas foster sauce into the bottom of the Bundt pan. Add in about 8 or 9 dough balls. Top with more sauce then a sprinkle of pecans. 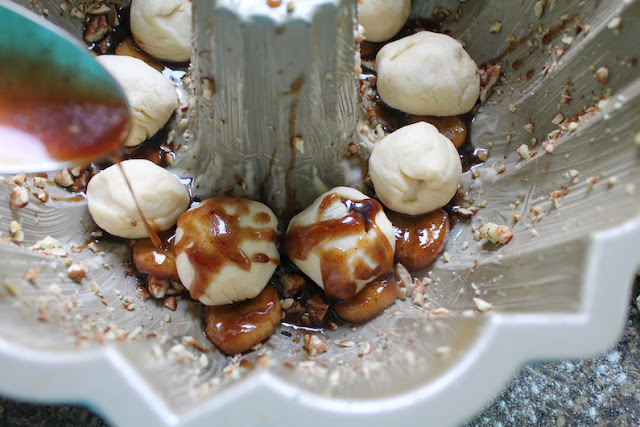 Add more dough balls, then more sauce and more pecans, until the dough balls are all used. Cover the pan with cling film and leave in a warm place for 45 minutes or until the bread has doubled. When rising time is almost up, preheat your oven to 350°F or 180°C. Remove the cling film and bake the bread for 25 minutes. Turn it out onto a serving pan, scraping any sticky topping left behind in the pan and spooning it onto the bread. 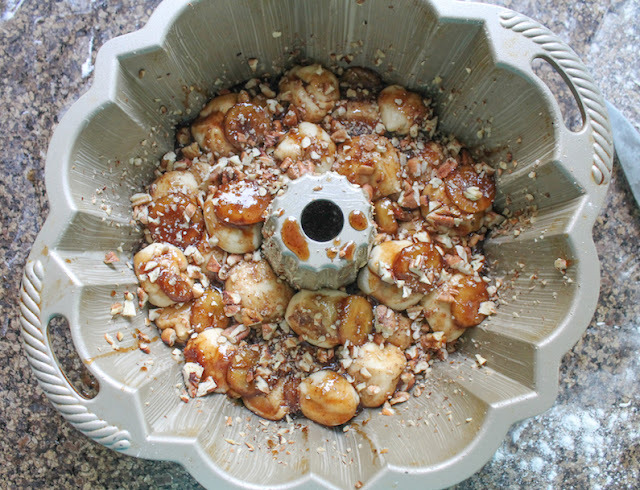 Warm the remaining sauce if it’s not pourable anymore and then drizzle it over the monkey bread. 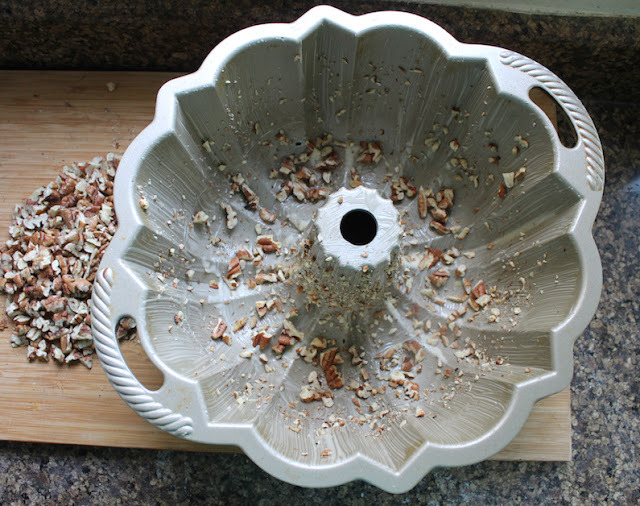 Top with reserved pecans. 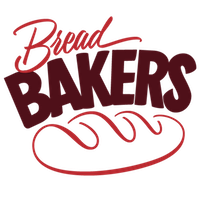 Many thanks to this month's host, Kelly of Passion Kneaded for this fabulous theme! 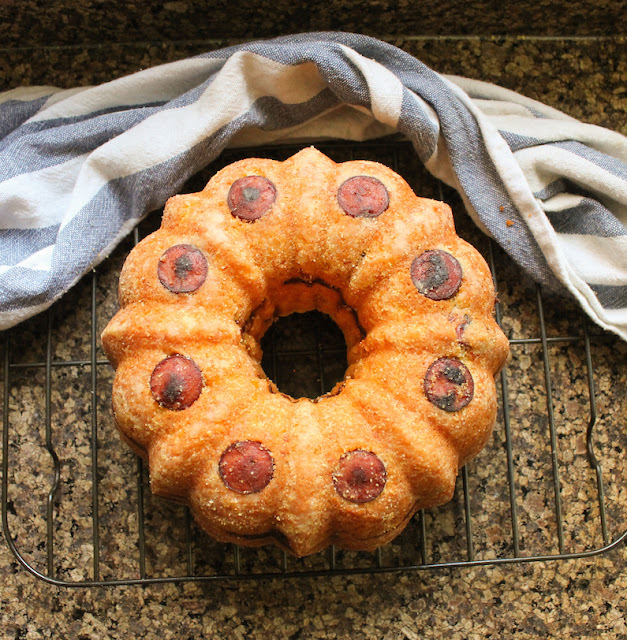 Check out all the pull apart breads, both savory and sweet, that we’ve baked for you this month. 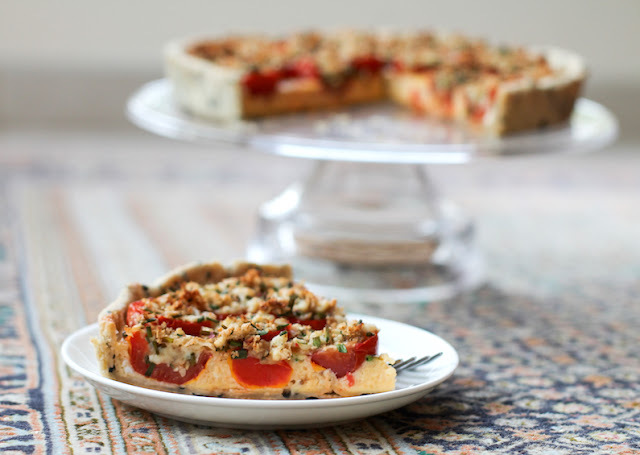 For a Christmas brunch or a Sunday lunch, this stuffed plum tomato tart with a savory black olive shortcrust is pretty enough to be the star of the meal. Do you ever come across a new ingredient in the grocery store that you just have to buy, even if you have no idea what you will make with it? I do! My most recent purchase was a container of mini plum tomatoes. Talk about cute! Well, I couldn’t just cut them up and put them into a salad because then, how would you know how cute they were? Right? I decided that the best way to showcase them would be to stuff and bake them. And the best way to get them to stay upright would be to make them part of a tart. This is a bit fiddly to make since you have to empty the tomatoes in order to fill them, but look at how pretty it turned out? Totally worth the time and, really, not a lot of effort. 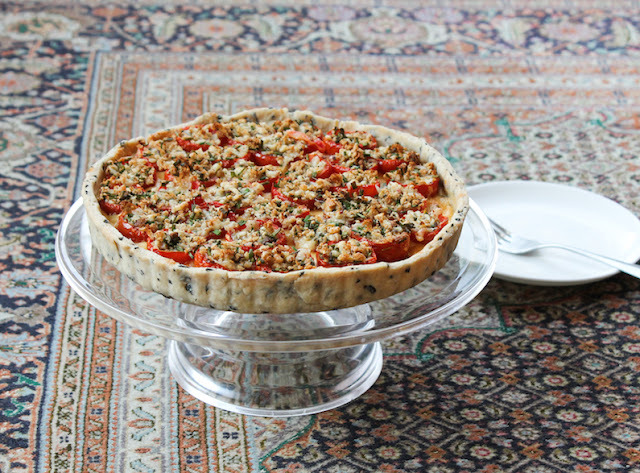 The flavors are Mediterranean, from the red ripe plum tomatoes and the mozzarella and anchovy stuffing, to the black olive shortcrust. 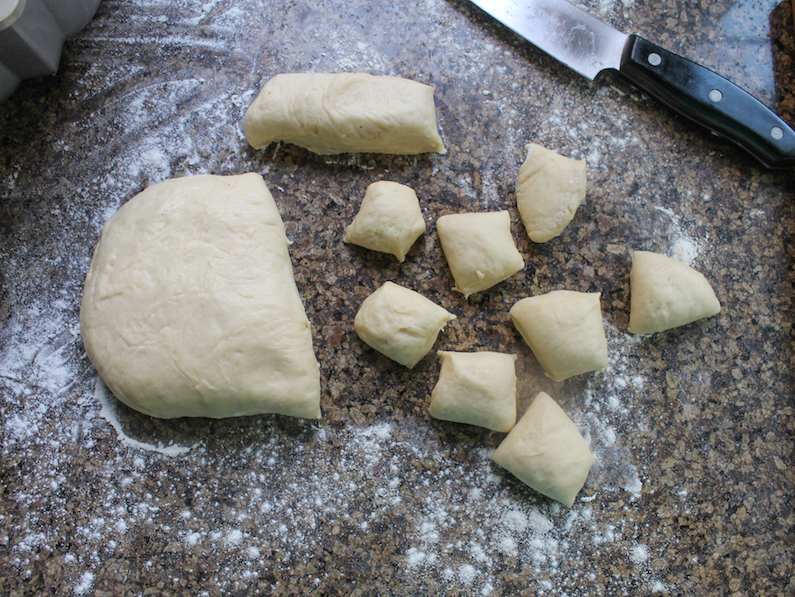 Make the pastry dough by lightly combining the shortening with the salt and flour, until you have crumbles. Fork through the minced black olives. 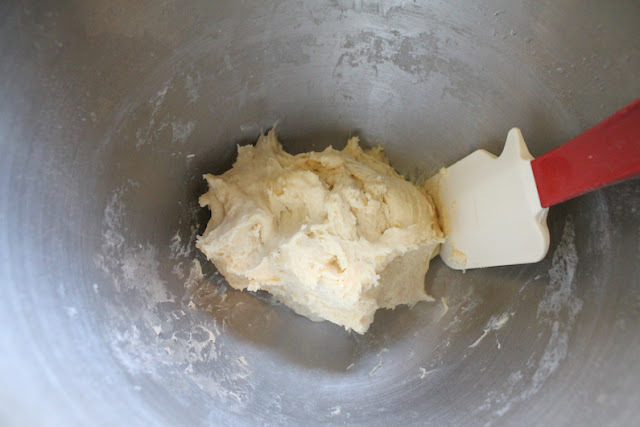 Add the cold water a little at time, mixing it in with a fork, until the pastry can form a ball. 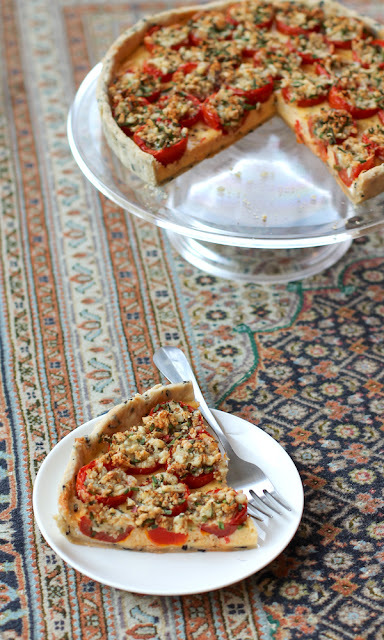 You can see my method, without the olives, in detail here: How to make a flaky pie crust. 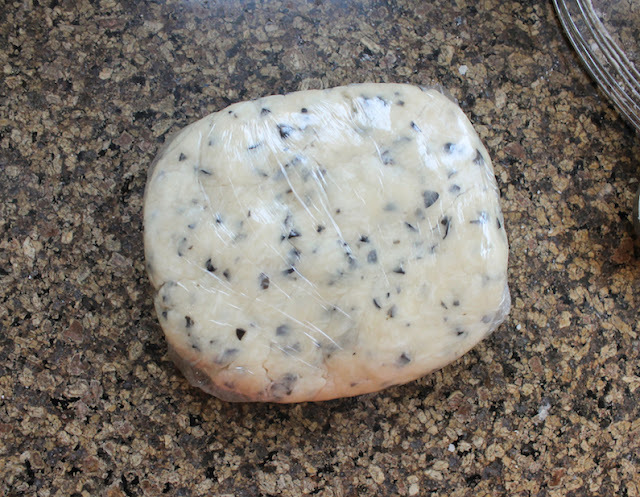 Wrap the dough in cling film. Chill. Halve and empty the plum tomatoes, reserving the liquid and flesh you have removed. 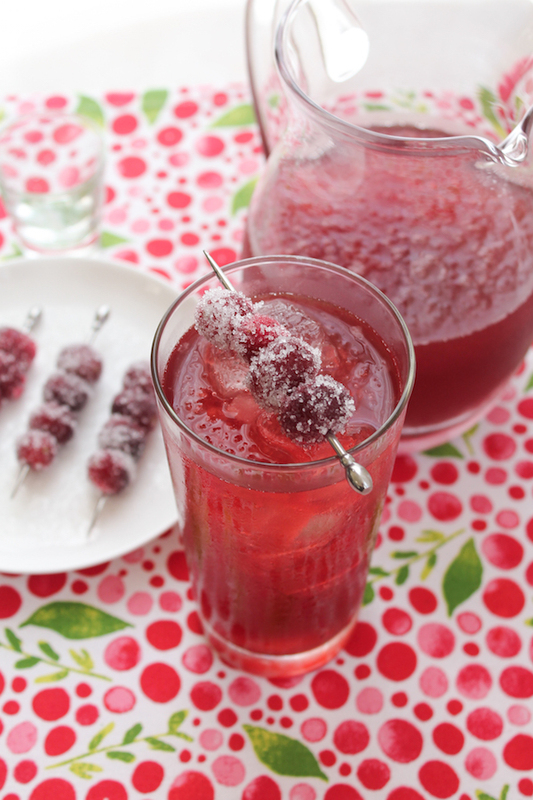 I used a melon ball scoop, which made this part really easy. Leave the tomato halves to drain cut side down on paper towels. Preheat oven to 350°F or 180°C. 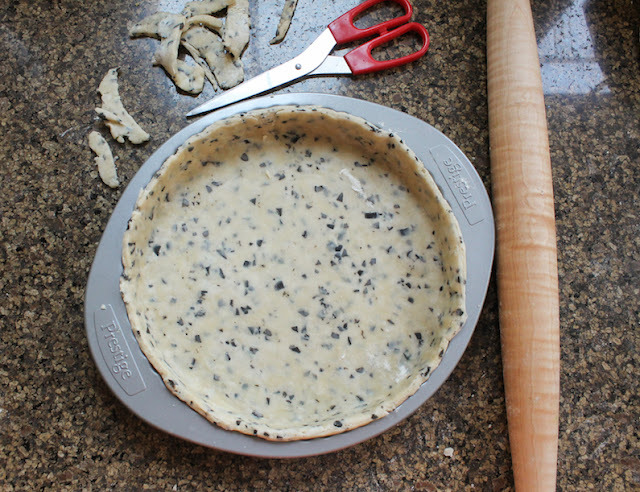 Lightly grease and line your 8 3/4 in or 22cm spring-form tart pan with baking parchment. 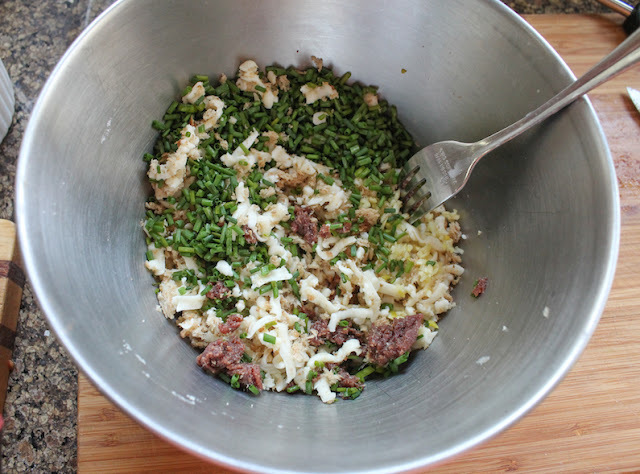 To make the stuffed plum tomato filling, mince the garlic, chives and anchovies. 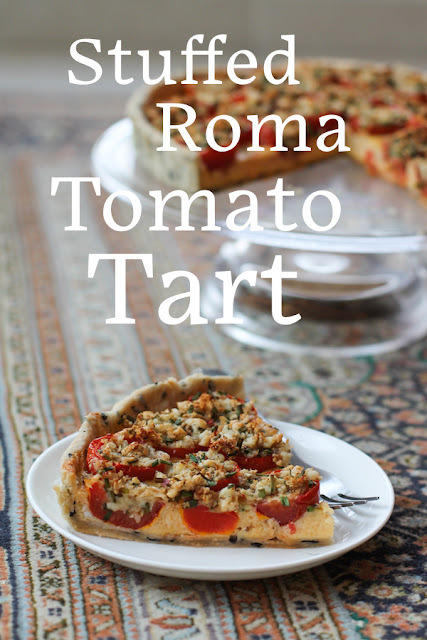 Mix them with the grated mozzarella, breadcrumbs and enough of the tomato insides to moisten. Roll out the chilled olive pastry crust and ease it into the prepared tart pan. Trim the pastry to fit or fold it over and make a decorative edge. Top with another piece of parchment and baking beads. Bake in your preheated oven for about 10 minutes. Remove the beads and parchment and bake another five. 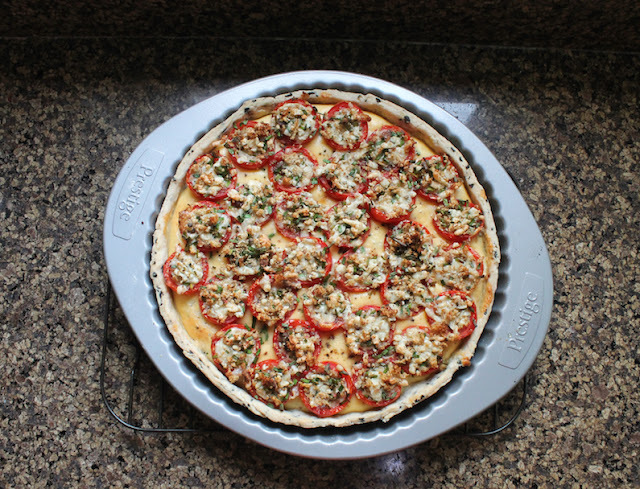 Remove the tart case from the oven and brush the bottom with a little olive oil. 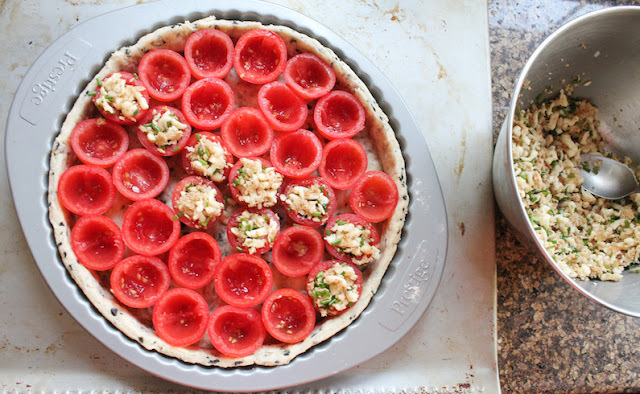 Stuff the tomato halves with the filling and put them cut side up in the tart case, close together so they support each other to stay upright. I piled them all in and then held one at a time to fill, then replaced it in the crust. Beat your eggs with the milk. 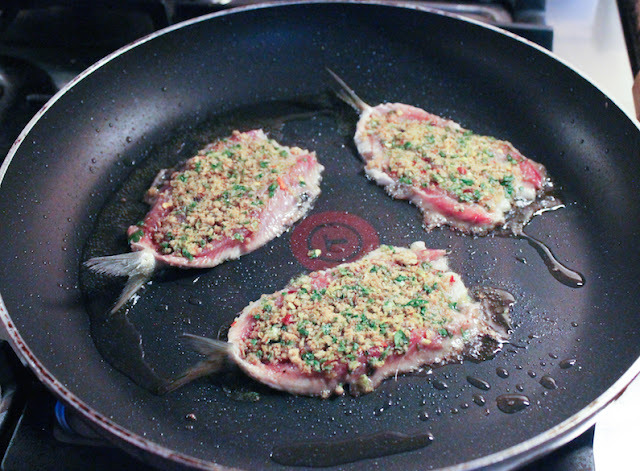 Add the Parmesan and a good few grinds of fresh black pepper and mix well. Carefully pour the egg mixture around the stuffed tomatoes. Give the whole tart another couple of grinds of fresh black pepper. 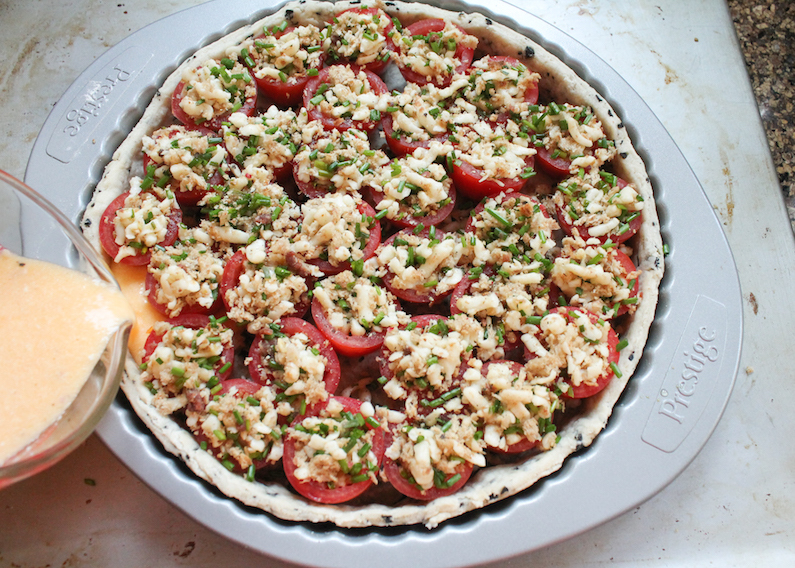 Bake for 35-40 or until the egg is set and the tomatoes are slumping. 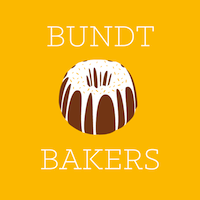 Today I am joining a group of avid bakers in a new group called Baking Bloggers. Our organizer is Sue from Palatable Pastime and for our inaugural post, she has chosen PIE as the theme. Check out all the other lovely pies and tarts, both sweet and savory, that we are sharing.